It’s easy to overcook pork chops, turning them dry and chewy instead of moist and tender. But it doesn’t have to be that way. Buy the best chops you can. 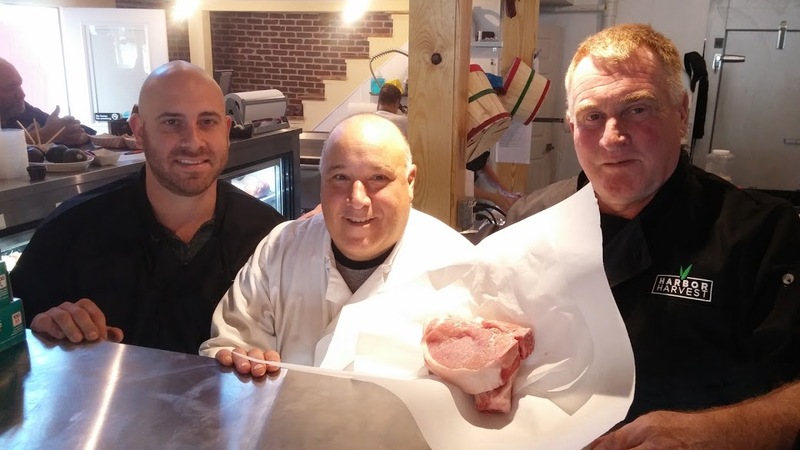 A custom or artisanal butcher will get you the best quality (Try Harbor Harvest in Norwalk). The following approach is best for thick chops – one inch or more. For thinner chops, I suggest braising. 2 thick cut bone-in pork chops. At least one inch thick, although closer to two is better. Heat the oil till shimmering in an oven proof skillet that will hold both chops in a single layer. Generously salt and pepper the chops on both sides. Brown the chops in the hot pan for 3 or 4 minutes to a golden brown color. Turn and brown the other side. When both sides are browned, drain any fat from the skillet and put the skillet with the chops in the oven. Cook the chops to an internal temperature of 145°. The length of time will depend on the thickness of the chops. Start checking with a thermometer after 10 minutes. When the chops are cooked, set them aside to rest, put the pan on medium heat, and sauté the shallots until wilted. Deglaze the pan with the cider. Stir in the mustard and reduce by half. Cut the meat off the bone, slice across the grain, and fan out the slices on the plate – steakhouse-style. Spoon some sauce over the slices. For deglazing, you can use any liquid or combination of liquids – chicken stock, wine, vermouth and the like. You can add a little cream to the sauce at the end, but be careful, it may break. I like to serve this with roasted brussels sprouts and boiled potatoes.